1. Preheat the oven to 110°C, gas mark ¼. Line a large baking tray with baking parchment. 2. Whisk the egg whites until stiff, then gradually whisk in 100g sugar a little at a time until glossy. 3. Spoon 10 dollops of meringue onto the prepared tray and bake for 2-2½ hours until dried out and crispy. Turn off the oven and leave them in the oven until cool. 4. Meanwhile, place the cherries, vanilla seeds, 50g sugar and ginger in a saucepan and simmer for 10 minutes. Allow to cool then drain and reserve the liquid. 5. 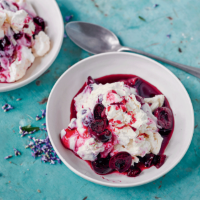 Just before serving, mix the cherries with the yogurt, break the meringue into chunks and stir into the yogurt. Divide between 4 bowls or large glasses and drizzle with the reserved cherry-ginger liquid.